Do You Think Creatively or Reactively? "...perception is not something that is immutably hardwired into the brain. It is a process that is learned through experience, which is both a curse and an opportunity for change. "Imagination comes from the visual system. Iconoclasm goes hand in hand with imagination. Before one can muster the strength to tear down conventional thinking, one must first imagine the possibility that conventional thinking is wrong. 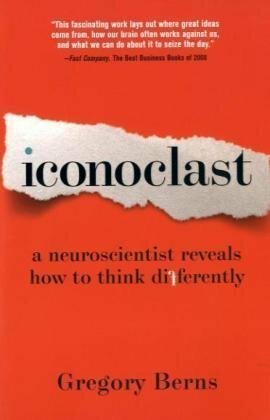 "If you imagine something less common, perhaps something that you have never actually seen, the possibilities for creative thinking become much greater because the brain can no longer rely on connections that have already been shaped by past experience. "There is a better way, a path that jolts the brain out of preconceived notions of what it is seeing: bombard the brain with new experiences. Only then will it be forced out of efficiency mode and reconfigure its neural networks. "...the networks that govern both perception and imagination can be reprogrammed. The frontal cortex, which contains rules for decision making, can reconfigure neural networks in the visual pathways so that an individual can see things that she didn’t see before simply by deploying her attention differently. "There is growing neurobiological evidence that when people reappraise emotional circumstances, the prefrontal cortex comes online and inhibits the amygdala. A recent fMRI study found that when people successfully reappraised emotional scenes, meaning they replaced a negative reaction with a positive one, activity in the left prefrontal cortex increased, in an amount that correlated with the decrease in the amygdala." Let's use our brain for good! Here, you will see the power of the prefrontal cortex and how it can override the amygdala and help reorient your focus and soften limiting beliefs that are keeping you from writing a new story that more matches what you want in your ideal work. This is the most powerful Play in Compass Playbook and it exclusively uses the technique of appreciative inquiry. You can use this Play for any issue you are having, whether you are in a low mood or want to get your mind off of the fact that you're not making progress toward living your ideal work. When you acknowledge and draw your focus to positive aspects of any person, situation or object, your feelings soften. The more you give your attention to what you don’t like or don’t want, the more things stay the same or worsen. The loving act of conscious and deliberate appreciation will neutralize any negative emotion and allow you to relax and turn your focus back to what you most want. Please don't confuse appreciation with gratitude. Appreciation is the closest emotion to love, whereas gratitude includes a sense of overcoming odds or things we don't want, which end up getting included in the thought. Keep your thinking in the energy of appreciation as you do this Play. Write an issue as it relates to the work situation you are facing at the top of the page, specifically one that is bothering or frustrating you most. Make a list of the things you appreciate about this issue. Look at it from all angles and possibilities. Consider it objectively and lovingly. Replay as often as needed to bump your emotion and get it pointed more closely to your Magnetic North. This is a great Play that you can begin every day with on a variety of topics that are on your mind. There are many people who dedicate a journal specifically for appreciative inquiry Plays. It's a great way to set the tone for your day.